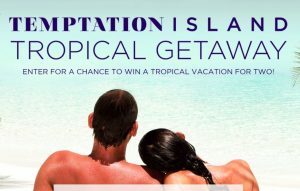 Enter for your chance to win a tropical vacation for Honeymoon from USA Network! GRAND PRIZE: There will be one (1) Grand Prize awarded (“Grand Prize”) to one (1) Grand Prize Winner. The Grand Prize will consist of the following: a six (6)-day, five (5)-night trip for Grand Prize Winner and one (1) guest (“Travel Companion”) to a Hawaiian island resort destination (determination of resort destination is at the sole discretion of the Sponsors and/or Administering Agency). The Grand Prize will include round-trip economy-class air transportation for Grand Prize Winner and Travel Companion from a major commercial airport near Grand Prize Winner’s home to an airport in or near the Sponsor-designated Hawaiian island resort destination (Grand Prize Winner and Travel Companion must travel on the same itinerary and final determination of the departure airport, destination airport, air carrier used, and flight times is at the sole discretion of the Administering Agency); ground transportation to and from airport to hotel in or near the destination; five (5) nights’ standard hotel accommodation (one (1) room, double occupancy, room rate and room taxes only) at a hotel as determined by the Administering Agency and Sponsors at their sole discretion); breakfast for two (2) each day at selected destination resort; one (1) special event dinner; two (2) destination events for the Grand Prize Winner and Travel Companion to be determined by and at the sole discretion of the Administering Agency; and five hundred dollars ($500) spending allowance for the Grand Prize Winner only (method of funding at the sole discretion of the Administering Agency). Estimated Retail Value (“ERV”) of Grand Prize is ten thousand dollars ($10,000). WEEKLY PRIZES: One (1) weekly prize (each a “Weekly Prize”) will be awarded to each of eleven (11) Weekly Prize Winners. Each Weekly Prize consists of a Temptation Island Swag Bag. Estimated Retail Value (“ERV”) of a Weekly Prize is two hundred dollars ($200). Weekly Prize will be awarded “as is” with no warranty or guarantee, either express or implied, by Sponsors. ERV of all Prizes is twelve thousand two hundred dollars ($12,200).